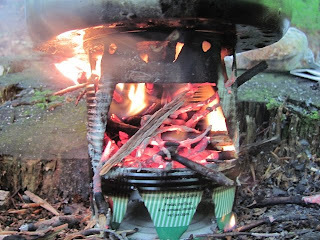 This article follows my blog post on how to make a hobo stove. I had a hard time getting the water to boil as all the wood I used was either wet or damp. For this reason this first test is not relevant. The water became hot enough for the broth to get done but that's not satisfactory for me - I want it to get to boiling temperature. The design seems to be good - with the tin can and the fire grate. However I would add some more lateral holes (air intakes) for a better ventilation and more efficient burning. The triangle holes at the top of the can allow the flame to get out and envelop the pot - which is a nice thing to watch as you're cooking your meal outdoors. I must stress that I had about 1.5 liters of water in the pot. Perhaps I could have got a cup of water to boil in a few minutes. 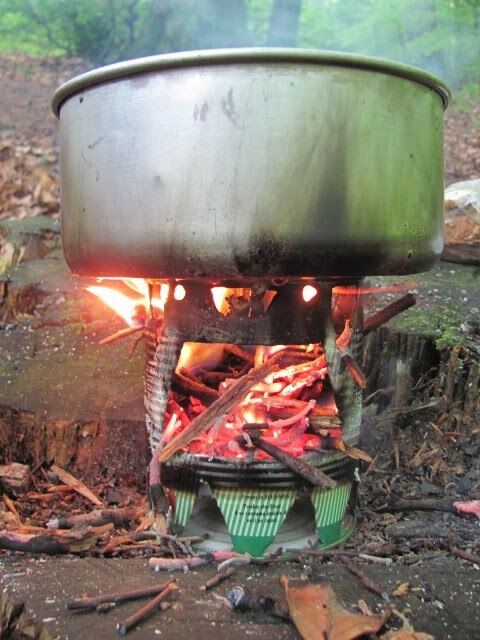 I normally cook a consistent broth for two or three persons when I go mountaineering and camping so I needed to see how the hobo stove would handle such a task. It took me about 30 minutes to get the broth to an edible state... I guess this time can be improved with dried wood and some small adjustments to the design of the stove. It's crucial to have a constant flame hitting the pot. Try to make your own hobo stove and leave me a comment or a video response with your experience. Cheers!